The Maningning Miclat Art Foundation, Inc. (MMAFI), in cooperation with District Gallery and Far Eastern University (FEU), is pleased to announce the extension of submission of Online Entries to the 2018 Maningning Art Competition to July 31, 2018. Entries must be submitted to maningning2018@gmail.com. Image file of the entry must be high-quality, high-definition, and in JPG format. Artist name, title, dimension, medium, and year of the artwork must be included. Passport photo, biodata, birth certificate, and entry form must be attached in email. Actual artwork of shortlisted entries must be submitted with a passport photo, biodata, copy of birth certificate, and notarized entry form to FEU President’s Committee on Culture Office no later than August 28. The painter is responsible for transporting and submitting entries to FEU. 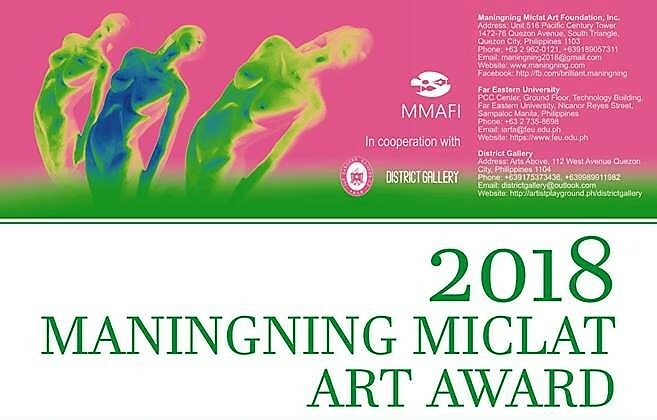 The painter hereby releases the Maningning Miclat Art Foundation, District Gallery, and FEU from any claims of damage to artwork due to storage or transport in connection with the competition. Shortlisted entries will be unveiled and exhibited at the Exhibit Hall of the Institute of Architecture and Fine Arts at Far Eastern University from September 3 to September 28. Awarding will be at FEU on September 28 back to back with the performance art, “Ginugunita Kita.” All submitted artworks will be available for sale. The top prize to be chosen by the Board of Judges will be awarded as follows: A Julie Lluch Sculpture trophy, 28,000.00 Pesos, Miclat book collection, and a solo exhibit at District Gallery.